The best versatile, easy to use, and affordable sump pump your hard-earned money will buy. There is no end to the uses of a good submersible pump. AKA, dewatering, garden hose, or sump pump these lightweight beauties are worth their weight in gold when the need arises. Just ask anyone that has had to deal with a flooding basement or crawl space. On the other hand, homeowners that enjoy their backyard swimming pool find themselves needing to drain the water off the pool cover before opening the pool each year. While still others need to drain and clean their water feature, fishpond or garden ponds each fall. Pump water from a flooded basement, drain a swimming pool, or empty a water feature quickly and easily. The fact remains, a Superior submersible pump will pay for itself many times over. Follow along as we discuss things you should know before you buy a submersible pump online. 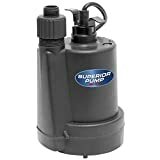 Get the best deals shopping at amazon.com and have your new pump delivered where you need it, when you need it. 1. Long used by Rental centers, plumbers, contractors, and farmers for a wide variety of dewatering jobs. The compact size of the 1/4hp Superior Pump utility pump provides exceptional pumping power in the compact, extremely durable package. 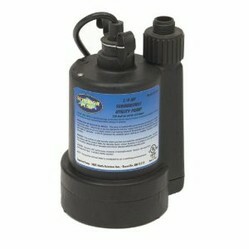 This 1/4hp sump pump pumps 30 gallons per-minute from a pool, pond, or flooded basement. 2. Using a garden hose, or 1-1/4-inch hose the 1/4 horsepower electric powered pump will pump water up a flight of stairs, out a window, or from a swimming pool 25 feet vertically. The durable thermoplastic corrosion-resistant construction and a compact design make it easy to fit this compact pump inside a 6-inch diameter opening, rain barrel or sump pump sump. 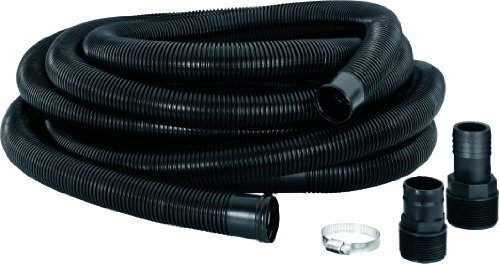 Selecting and using the proper size power cord and discharge hose makes a big difference. 1.10-foot replaceable power cord provides plenty of length for any homeowner, renter, or commercial user needing to transfer water. 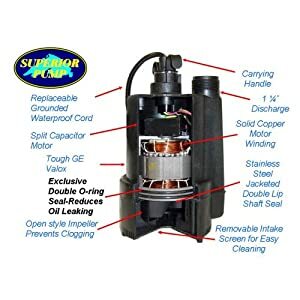 With the purchase of the optional float switch, the Superior 1/4hp submersible pump allow the user to leave the pump and it’s continuous duty motor to work as a sump pump, drain a swimming pool, or drain a water garden. 2. With the 1-1/4-inch NPT male pipe outlet fitting, the compact pump works well for permanent use, such as a basement or crawl space sump-pump, or power a water fountain. 3. 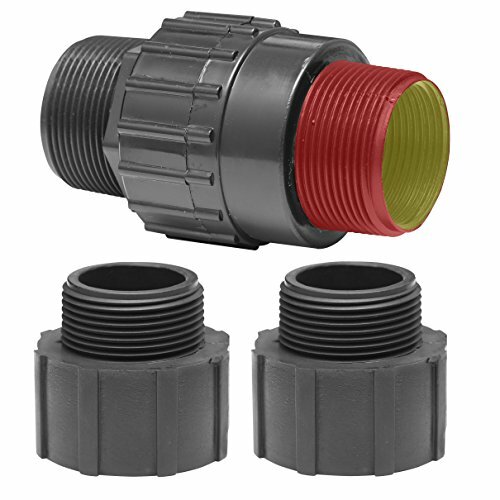 Using the adaptor fitting that reduces the 1-1/4-inch fitting, to the 3/4-inch garden hose fitting. The Superior 91250 pump is the perfect go-any-where electric submersible water pump. Hey, @katiem2 thanks for the kind words. After years of working in the general tools and equipment industry specializing in DIY, Handyman and contractor wants and needs. I have amassed a huge amount of helpful tips and tricks I hope to share. Please do not hesitate to private message or ask here, and I will do my best to answer. Engineered to be safe, lightweight, strong, and inexpensive, the Little Giant Flip-N-Lite Ladder is easy to set-up, use and store in the garage or closet. Oh the joys of homeownership, raking leaves, composting grass clippings and dealing with garden debris. Save time and money, use a collapsible trash can.